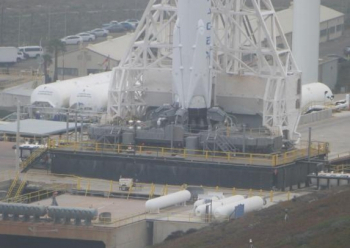 SpaceX engineers rolled out the two-stage rocket Friday to Space Launch Complex 4-East at Vandenberg, and the Falcon 9 launch team oversaw a computer-controlled countdown and fueling sequence ahead of Saturday’s static fire test. Restraints kept the rocket firmly grounded on its hillside launch pad overlooking the Pacific Ocean as the Merlin 1D engines throttled up to 1.7 million pounds of thrust for several seconds. The hold-down firing is a customary part of all SpaceX launch campaigns, used by engineers to confirm the readiness of the launcher and ground systems, and as an exercise of the ground team. The next step in SpaceX’s launch campaign at Vandenberg will be the removal of the rocket from the pad for attachment of the Formosat 5 spacecraft, a Taiwanese satellite designed to test out the country’s domestic aerospace manufacturing capability and collect a range of black-and-white and color imagery of Earth. 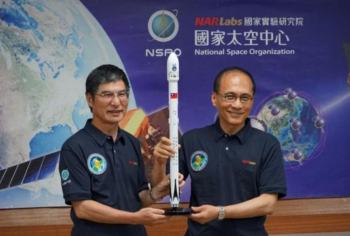 Developed and funded by Taiwan’s National Space Organization, or NSPO, Formosat 5 weighs around 1,047 pounds (475 kilograms) with a full load of fuel, according to information posted on NSPO’s website. After flying south from Vandenberg, the Falcon 9 rocket will send the Formosat 5 satellite into a 447-mile-high (720-kilometer) sun-synchronous orbit that passes near Earth’s poles. Liftoff is scheduled for Thursday, Aug. 24, at 11:50 a.m. PDT (2:50 p.m. EDT; 1850 GMT) at the opening of a 44-minute launch window. 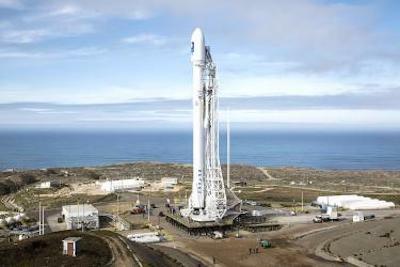 The launch will be the fifth time a SpaceX Falcon 9 rocket will blast off from Vandenberg, an Air Force-run base on California’s Central Coast northwest of Los Angeles. It will be the 40th Falcon 9 launch overall, including flights departing from SpaceX launch pads in Florida. SpaceX plans to return the Falcon 9’s first stage to a drone ship positioned downrange in the Pacific Ocean for refurbishment and reuse. The booster launching Formosat 5 is fresh from the factory and making its first flight. Formosat 5 will only take up a fraction of the Falcon 9’s lift capability, and officials from NSPO and SpaceX originally planned to launch the satellite on a Falcon 1e rocket. But SpaceX discontinued the small launcher, which was powered by a single Merlin booster engine, in favor of developing the Falcon 9 and larger rockets. 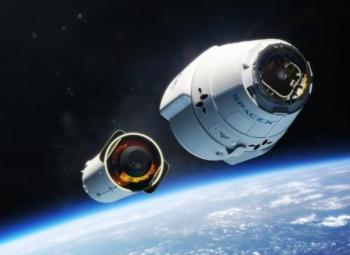 The Taiwanese government, through the National Space Organization, originally paid SpaceX around $23 million in 2010 for the launch, less than half of the advertised price of a Falcon 9 launch today. The SpaceX Falcon 9 launch vehicle that will be used to launch the Formosat-5 satellite next week is pictured at Vandenberg Air Force base in an undated photograph. Final preparations are under way for the launch of Formosat-5, Taiwan’s first domestically developed and built satellite, from a US air base next week, an official said on Friday. The satellite, which arrived at Vandenberg Air Force Base in California last month, is scheduled to be sent into space on Thursday. The National Space Organization’s (NSPO) Formosat-5 project director Chang Ho-pen (張和本) said that testing in past weeks indicated that the satellite is functioning normally. Although it took some time to integrate Formosat-5 with its launch vehicle, SpaceX’s Falcon 9, work has been successfully completed, Chang said. Through Formosat-5, Taiwan will show the world that it is capable of independently building satellites, he said. The satellite was designed by the NSPO and built by more than 50 domestic teams, including teams from CMOS Sensor Inc and National Central University. The high-resolution optical remote-sensing satellite is the NSPO’s fourth satellite since its space program started in 1991, and the first to be fully produced domestically, from design and manufacture to assembly and testing. 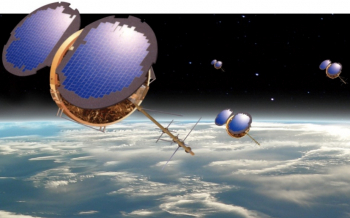 It is to replace Formosat-2, which was retired in August last year. Formosat-5 is to collect data for scientific research, passing over Taiwan once every two days, the NSPO said. The satellite is to provide 2m panchromatic and 4m multispectral resolution images for a wide array of applications, including governmental, disaster forecasting and mitigation, national security and environmental observation tasks, as well as international technological exchanges, academic research and international humanitarian assistance, the NSPO said. The satellite is to carry an Advanced Ionospheric Probe, which can develop weather models in space, monitor ionospheric disturbances and study seismic precursors associated with earthquakes, the organization said. It took six years and NT$5.7 billion (US$188 million) to develop the 450kg satellite, which is 2.8m high, and 1.6m in diameter, the NSPO said. Taiwan’s first fully home-grown satellite, Formosat-5, will hitch a ride to orbit on Thursday, 24 August, as SpaceX ratchets its flight rate back up after a summer of infrastructure upgrades and maintenance on the East and West Coasts of the United States. Launch of the 12th Upgraded Falcon 9 of the year is targeted to occur from Space Launch Complex (SLC)-4E at Vandenberg Air Force Base, Calif., during a 44-minute “window”, which opens at 11:50 a.m. PDT. 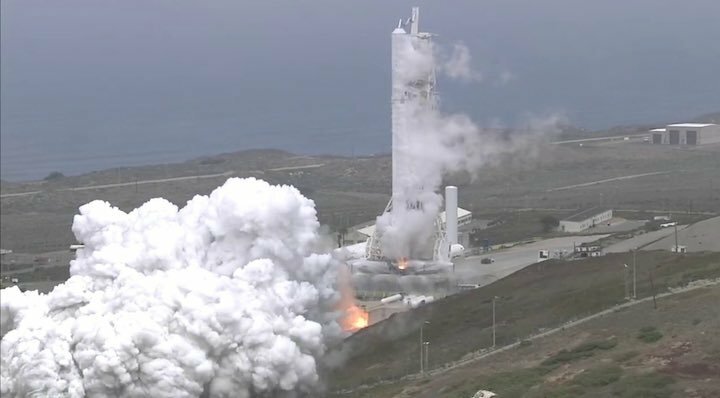 It will mark SpaceX’s fifth flight out of mountain-ringed Vandenberg and its third in 2017 alone, coming on the heels of two batches of Iridium NEXT communications satellites, the first in January and more recently in late June. WASHINGTON — A SpaceX Falcon 9 successfully launched a long-delayed remote sensing satellite for the government of Taiwan Aug. 24, executing another first stage landing in the process. The Falcon 9 lifted off from Vandenberg Air Force Base in California at 2:51 p.m. Eastern, at the beginning of a 42-minute launch window. SpaceX reported no technical issues during the countdown, and foggy conditions at the launch site earlier in the morning partially cleared by launch time. The rocket’s only payload, the Formosat-5 remote sensing satellite, separated from the upper stage a little more than 11 minutes after launch. The satellite was deployed into a sun-synchronous orbit at an altitude of 720 kilometers. 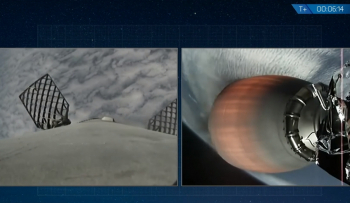 SpaceX, during the launch webcast, declared the launch a success. 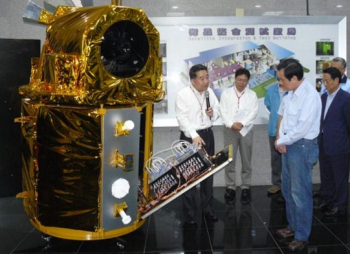 Formosat-5 was built by Taiwan’s space agency, the National Space Organization, known by the acronym NSPO. The 450-kilogram spacecraft was the first such satellite built domestically by Taiwan, and succeeds Formosat-2, retired a year ago. The spacecraft carries cameras capable of producing panchromatic images at a resolution of two meters and color images at a resolution of four meters. It also carries an ionospheric science instrument developed by a Taiwanese university. NSPO awarded the launch contract for Formosat-5 to SpaceX in 2010, at the time intending to launch the spacecraft on SpaceX’s smaller Falcon 1 rocket. SpaceX later discontinued the Falcon 1, moving Formosat-5 to a larger Falcon 9 vehicle. Terms of the contract were not disclosed, but NSPO is widely understood to be paying far less than the Falcon 9 list price of more than $60 million for this launch. At the time of the contract, SpaceX expected to launch Formosat-5 by early 2014. The change in launch vehicles and delays in SpaceX’s launch schedules, including those caused by two Falcon 9 failures in 2015 and 2016, significantly delayed the launch. 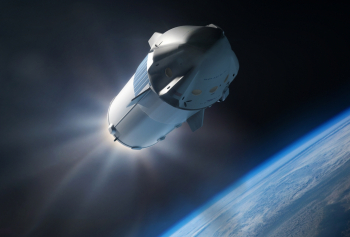 SpaceX previously planned to fly a secondary payload, the Sherpa bus from Seattle-based Spaceflight Industries, which would have deployed nearly 90 small satellites after separating from the Falcon 9 upper stage. However, Spaceflight announced in March that it had decided to find alternative rides for those secondary payloads because of “significant” delays it expected in the Formosat-5 launch. The launch also features another landing of the Falcon 9 first stage, in this case on a droneship called “Just Read the Instructions” in the Pacific Ocean. This was the 15th successful landing of a Falcon 9 first stage in 40 liftoffs, and the ninth to land on a ship. The launch was the 12th Falcon 9 mission of 2017, and the second in 10 days, after the launch of a Dragon cargo spacecraft Aug. 14 from the Kennedy Space Center in Florida. The next Falcon 9 launch, of the U.S. Air Force’s X-37B spaceplane, is planned for early September from Florida. SpaceX launched its fortieth Falcon 9 Thursday, carrying the Formosat-5 spacecraft for the Taiwan’s National Space Organisation and the Republic of China’s National Space Organisation. The launch, which included a successful landing of the first stage aboard the Autonomous Spaceport Drone Ship, occurred at the start of a 44-minute window that opened at 11:50 local time (18:50 UTC) from Vandenberg Air Force Base in California. Formosat-5 is an Earth remote sensing satellite which was built and operated by the National Space Organisation of the Republic of China (Taiwan). It is the first spacecraft larger than a CubeSat to be developed and constructed by the Republic of China, although Taiwanese officials proudly insist this is an ingenious spacecraft. Equipped with the Remote Sensing Imager (RSI) payload, providing multispectral and panchromatic imaging capabilities, Formosat-5 will replace the Formosat-2 satellite which was retired last August. Formosat-5 also carries the Advanced Ionospheric Probe, or AIP, package, which will study the behavior of plasma within Earth’s ionosphere. The spacecraft has a mass of 475 kilograms (1050 lb) and is expected to operate for at least five years. It will be placed into a near-polar sun-synchronous orbit at an altitude of about 720 kilometers (447 miles, 389 nautical miles). The Remote Sensing Imager is the primary instrument aboard Formosat-5. Built by a partnership of the National Space Organisation and industrial partners within the Republic of China, the instrument is a push-broom imager with a 45-centimetre (18-inch) Cassegrain reflector telescope. It is expected to produce panchromatic images with a resolution of up to two meters (6.5 feet) per pixel, and multispectral images with a resolution of four meters (12 feet) per pixel. Multispectral images will consist of red, green, blue and near-infrared bands. Taiwan’s National Central University is responsible for the Advanced Ionospheric Probe (AIP) aboard the spacecraft. This payload consists of a planar Langmuir probe, a retarding potential analyzer, an ion trap and an ion drift meter. It will record the composition and density of plasma within Earth’s ionosphere, the velocity of incident ions and the temperature of ions and electrons within the ionosphere. Taiwan’s National Space Organisation – also known as the NSPO, an abbreviation of its previous name, the National Space Program Office – is the country’s national space agency. Formosat-5 is the latest in a series of missions in the NSPO’s Formosat series of remote sensing spacecraft. The first satellite, Formosat-1, was launched in January 1999 aboard Lockheed Martin’s Athena I rocket. Formosat-2, the spacecraft which Formosat-5 will replace, was deployed by a Taurus rocket in May 2004. At the times of their launches, Formosat-1 and 2 were named ROCSAT-1 and ROCSAT-2 respectively, taking on their new names in late 2004. Although only designed for a five-year operational life, Formosat-2 completed twelve years of service before a malfunction last June forced its retirement two months later. These spacecraft were joined in orbit in April 2006 by the six-satellite Formosat-3 constellation, also known as the Constellation Observing System for Meteorology Ionosphere and Climate, or COSMIC. A joint mission between the Republic of China and the United States, these satellites were deployed by a Minotaur I rocket. A replacement constellation, Formosat-7 or COSMIC-2, are slated for launch aboard the second Falcon Heavy launch, scheduled for next year. Formosat-5 rode to orbit aboard SpaceX’s Falcon 9 rocket, flying from Space Launch Complex 4E at Vandenberg Air Force Base. In 2010, when NSPO originally signed a contract with SpaceX to deploy Fomosat-5, the spacecraft was slated for a late-2013 launch aboard a Falcon 1e rocket from Omelek Island in the Pacific Ocean. The Falcon 1e, an enhanced and more powerful version of the Falcon 1 design, never flew, and SpaceX launches from the Omelek site stopped following the fifth and final Falcon 1 mission in July 2009. Launching alone atop the much larger and more powerful Falcon 9, Formosat-5 makes for one of that rocket’s lightest payloads. A Spaceflight Incorporated rideshare payload, consisting of a SHERPA adaptor with up to ninety small satellites, had been scheduled to fly as a secondary payload however this was removed from the launch due to uncertainty over the launch date, after Falcon 9 was grounded towards the end of last year. Thursday’s launch was the fortieth flight of the Falcon 9, which first flew in June 2010, and the rocket’s twelfth mission of 2017. The launch comes almost a year after a Falcon 9 vehicle exploded at Cape Canaveral’s Space Launch Complex 40 (SLC-40) while it was being fuelled for a static fire test. The Amos 6 satellite, which the rocket had been due to launch a few days after the test, was destroyed in the explosion and the launch complex sustained heavy damage from which it has not yet returned to service. The Amos 6 accident occurred during a ground test, so Falcon 9’s only in-flight failure came during the June 2015 launch of CRS-7, a Dragon spacecraft intended to resupply the International Space Station. A strut within the second stage broke late during first stage flight, allowing a composite overwrapped pressure vessel (COPV) containing helium – used to pressurize Falcon’s tanks – to break loose and vent its contents into the liquid oxygen tank. This overpressurized the tank, leading to the structural failure of the stage and subsequently the rocket. These failures have been the exception, rather than the norm, for a rocket that is quickly becoming a workhorse of the commercial space industry. As well as deploying commercial Earth imaging and communications spacecraft – including fleets of satellites for Orbcomm and Iridium – Falcon regularly boosts CRS Dragon’s to the ISS, has launched the DSCOVRand Jason-3 spacecraft for NASA, and is beginning to eat into United Launch Alliance’s (ULA) near-monopoly on military launch contracts. In May Falcon deployed the NROL-76 payload for the National Reconnaissance Office, while the rocket’s next launch is expected to carry the US Air Force’s X-37B spaceplane into orbit for its fifth mission – the previous four flights having been boosted by ULA’s Atlas V.
From next year, Falcon 9 is also expected to carry crews to the International Space Station via a manned version of Dragon, developed under NASA’s Commercial Crew program. Falcon 9 was designed to be at least partially reusable. While early launches – using a version of the rocket now retrospectively known as Falcon 9 v1.0 – unsuccessfully attempted to return the first stage via a parachute system, SpaceX has since developed and refined techniques to achieve a powered landing. Depending upon mission requirements, Falcon’s first stage, or Core, can now either fly back to the launch site or, if additional performance is required to complete the primary mission – delivering the payload to orbit – an Autonomous Spaceport Drone Ship (ASDS) can be deployed to perform recovery downrange. The Autonomous Spaceport Drone Ship, a converted barge, will be used for the recovery attempt during Thursday’s launch. The first stage will be targeting Just Read The Instructions, the West Coast ASDS, positioned off the coast of California. Despite the low mass and target orbit for the Formosat launch, SpaceX is yet to attempt a return-to-launch-site landing on a mission from Vandenberg. 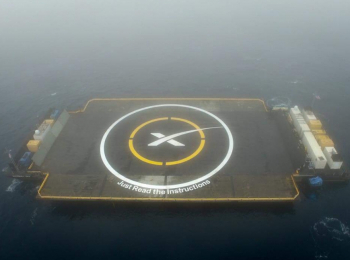 A landing pad has been constructed on the site of the former Space Launch Complex 4W. Thursday’s launch marked SpaceX’s twentieth attempt to land a Falcon 9 first stage, not including the CRS-7 launch which failed before recovery could be attempted. Fifteen landings have been conducted successfully – six on land and nine at sea – including the last ten attempts. This latest attempt was another success. Of the three previous launches from Vandenberg on which recovery has been attempted, two cores were recovered. The third, during January 2016’s Jason-3 launch, landed on target, however, one of the landing legs failed to lock into position, leaving the core to topple over and explode after touchdown. 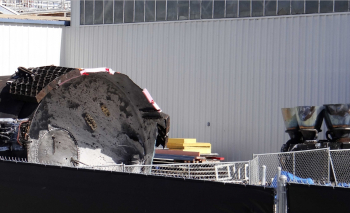 (L2 photo of Jason-3 booster remains in a SpaceX’s Los Angeles yard). Two recovered first stages have been reused on subsequent missions – the first stage recovered from last year’s CRS-8 Dragon launch flew again as part of the rocket that deployed the SES-10 communications satellite in March, while the first stage from January’s launch of ten Iridium-NeXT satellites was reflown in June with BulgariaSat-2. Thursday’s launch uses a newly-built first stage, Core 1038. The Falcon 9 that deployed Formosat-5 was the Falcon 9 v1.2 model, or Falcon 9 Full Thrust, which was introduced in December 2015. The third major revision of the Falcon 9 design – after the original or “v1.0” model and the stretched and uprated Falcon 9 v1.1 which was used from 2013 to 2015. Falcon 9 is a two-stage rocket, with both stages burning RP-1 kerosene propellant oxidized by supercold liquid oxygen. 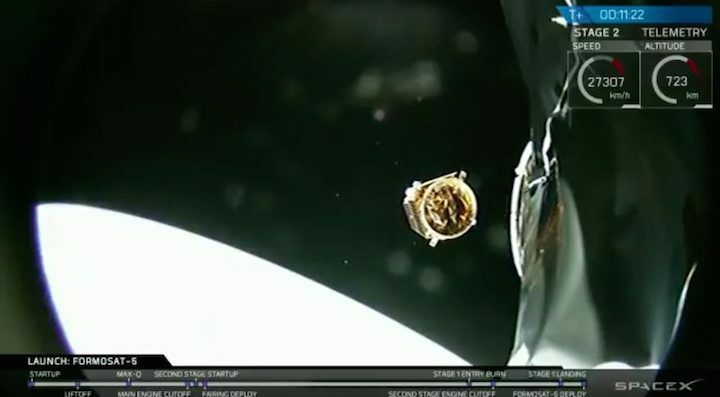 It took a little over eleven minutes for Falcon to inject Formosat-5 into the planned orbit. Three seconds before Thursday’s countdown reached zero, the first stage – Core 1038 – ignited its nine Merlin-1D engines. At zero, Falcon 9 lifted off to begin her climb towards low Earth orbit. The nine engines of Core 1038 powered Falcon for the first two minutes and twenty-eight seconds of her ascent. As the rocket climbed through the atmosphere, it experienced peak aerodynamic pressure about sixty-nine seconds into the mission. Four seconds after the end of the first stage burn, Core 1038 separated from the second stage, which then ignited its single vacuum-optimised Merlin-1D seven seconds after separation. Fourteen seconds into the second stage burn the payload fairing, which protected the satellite as the rocket passed through the atmosphere, was jettisoned. The second stage will only made one burn prior to spacecraft separation, inserting Formosat-5 into a sun-synchronous low Earth orbit. This burn lasted six minutes and thirty-eight seconds. After second stage engine cutoff, or SECO, the rocket coasted for 121 seconds before spacecraft separation. About half a minute before SECO, at eight minutes and 45 seconds mission elapsed time, the first stage reignited a subset of its engines to perform an entry burn. This slowed the stage as it re-entered Earth’s atmosphere, helping to protect it as it falls back to Earth. The stage landed aboard Just Read The Instructions at ten minutes and 47 seconds elapsed time, after a landing burn, using a single engine, shortly before this time. Following a successful landing, Core 1038 will be secured aboard the drone ship, which will then convey to Los Angeles. Thursday’s launch, the twelfth of the year for SpaceX and the Falcon 9, comes less than a fortnight after the rocket’s previous launch, from Florida’s Kennedy Space Center. The next Falcon 9 launch will also occur from Kennedy, with the rocket expected to deploy an X-37B mission for the US Air Force on 7 September. The rocket’s next launch from Vandenberg is scheduled for the end of September, with another ten Iridium communications satellites.